Cristi Fer Art Gallery and Workshops, in San Miguel de Allende, Mexico: Summer Painting Workshop attention teachers a great relaxing vacation in Mexico! Summer Painting Workshop attention teachers a great relaxing vacation in Mexico! San Miguel de Allende is one of the must visited town of Mexico! Tacked in between gentle rolling hills, adorned by charming Colonial architecture, narrow cobble stone streets, cheerful parades all year around, mariachi in the park, fantastic Mexican food, and well known hospitality, it is an ideal place all year around to run away from hit or snow blizzards. It is so much to do and enjoy here! 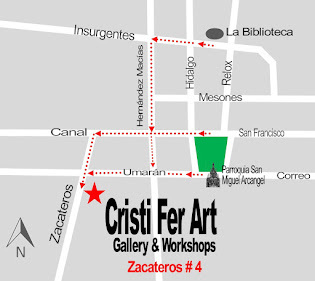 We (Cristi Fer Art) are fortunate to have established our art studio and gallery in this enchanted town. We love to share this charm with you and make it even more by adding a painting workshop to your trip. 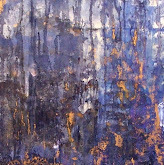 We work with all levels of painting experience from none to well experience artists. The schedule, painting in the mornings and enjoying the afternoons. Have an ice creme cone in the park while watching the vendors, and kids, or stroll the streets, find your favorite restaurant, go to a concert or play. When traveling alone or with friends, taking a painting workshop in San Miguel, at Cristi Fer Art Studio and Gallery will make this special vacation even more unforgettable! Contact us wish your travel plans. Let us know your level of experience and artistic goals! Groups of 4 to 6 receive 5% discount!